Contrary to what you may believe, coffee filters aren’t just for coffee anymore! I’ve always loved the look of the parchment colored paper coffee filters, I guess because they remind me of antique grain sacks and burlap……two of my favorite things! 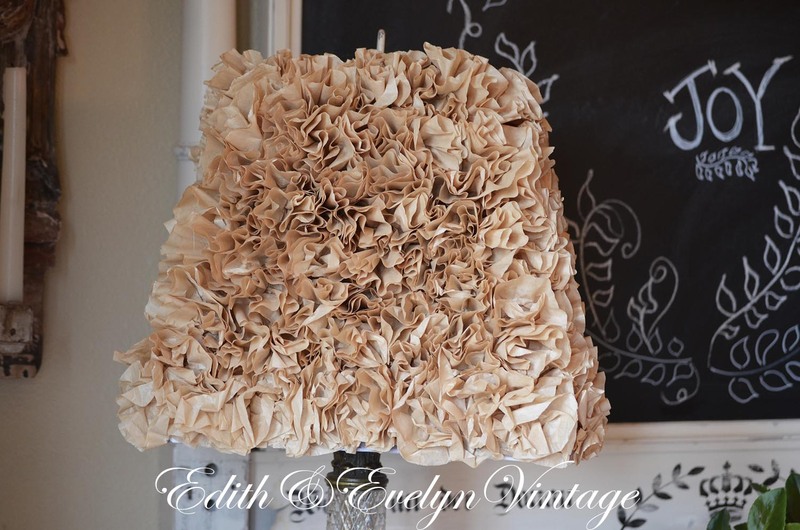 Thumbing through a magazine one day, I read about a very crafty person using paper coffee filters to embellish frames and thought it would be a very cool way to cover an old lamp shade in them. It was so simple to do, and I love the end result. The lamp shade looks like it’s covered in flowers. Take a coffee filter and spread it out flat, fold in half, and then half again. Holding the filter at the bottom, sort of “scrunch” it and separate the layers, you can even “squash” it a little bit to give it more of a distressed look. There really is no right or wrong way. Starting at the top of the lamp shade, add some glue from your hot glue gun and then push the filter into the glue, holding for a few seconds for it to set. Beware of burned finger tips! Repeat along the first row, then start on the second. I wasn’t sure how to space them, I just wanted it to be nice and full, so I placed them pretty close together. Once they are set, you can fluff them more to get the look you want. I thought it turned out so cute! I placed it on an antique crystal lamp and everyone that sees it comments on it! It’s a great way to update an old shade. Coffee filters would make a beautiful wreath as well, just glue them on a foam circle, then tie with a ribbon and hang! A wreath made with white coffee filters and tied with a red ribbon would be gorgeous for Valentines Day! Hope the instructions make sense, if not, please ask, but trust me, it’s a very simple project! We would be tickled pink if you would sign up to follow our blog! « Neither Sleet, Nor Snow, Nor Dead of Night………. Thank you for this. It is really pretty and I have a case of “My dog ate my lampshade” if you can believe it! An overzealous game of indoor fetch to blame. I’ve kept the lampshade on, moving it slightly every day so to not see the visible crease in it. This is the perfect solution. I really appreciate it! Just stumbled upon this post, love it! I recently bought an antique lamp that this will suit perfectly. I love the color of the unbleached filters. Coffee filters are so versatile, I made wedding flowers out of them for my sister in law last summer and they looked amazing on the tables (dyed with food coloring). Thanks for this idea I will be doing it this weekend! Oh my! My son just cracked a small shade the other day and I was wondering how in the world I could rescue it. I’m on my way to the store for coffee filters right now! Thank you for such a wonderful idea! I love the wreath idea as well! Can’t wait to get started! Love this idea, so pretty, As children, we used to make tissue flowers, out of Kleenex, and this is something like that. Such a fun idea, and looks great! I would have thought this shade cost a fortune, as I recently bought some new lampshades, and they were over $22 each, and small. But, I did keep a large shade, incase I ever found a good idea, now I have one, thanks. Thank you Carolyn for commenting! Yes, it is reminiscent of those tissue flowers! I have a question you said that the coffee filters are white but in the picture they look like there are peach color, did you color the coffee filters? The coffee filters are actually a parchment color which I bought at the store this color. I don’t understand folding it in 1/3’s, how would you do that when it’s already in half. The picture looks like you folded it in half and then half again which would be 1/4. Hi Gloria! Now that I think about it, you are right! It’s folded in half, then half again!